An art series by Heue. It’s taken us a while, but we’re finally ready to introduce to the world our resident artist, Sam Auditeur. Going by the artist moniker of Heue, Sam creates art in various mediums documenting the stories of those in between estrangement and reconciliation. Her childhood dream of colour-grading the world is now being harnessed with a brush in hand. She paints abstraction as a type of portraiture, mirroring the narratives of her encounters with people and places. Her obsession with colours remedy nostalgia and are a retrospect to surviving this beautiful madness that is life. Sam has been a part of our little Moon family since January 2019, and over multiple cups of coffee and quiet conversations in her mezzanine studio, she’s put together a show. Titled ‘Work In Progress’, the series will be her last batch of canvas works for a while and we invite you to come and enjoy the art. And while you’re at it, view them with a sip of our custom drink for the show, the Shana; or join us for a pour workshop with Sam herself over the weekend. 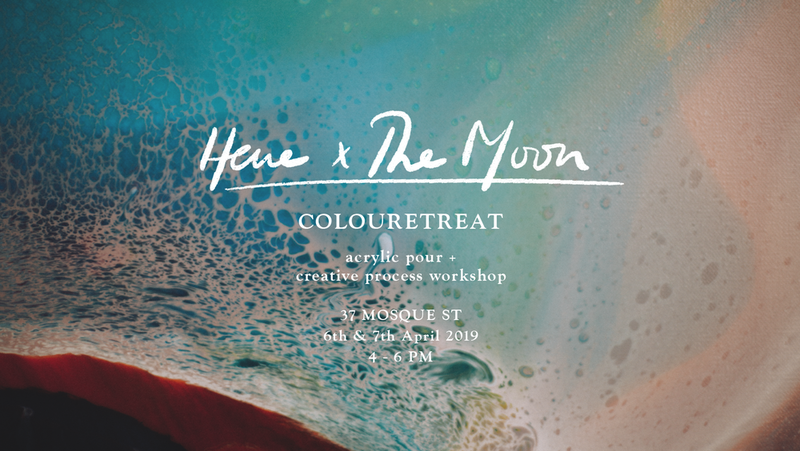 You’re cordially invited to a pour workshop and a retreat to colour, hosted by Sam. Click on the image below for more details and to sign up.